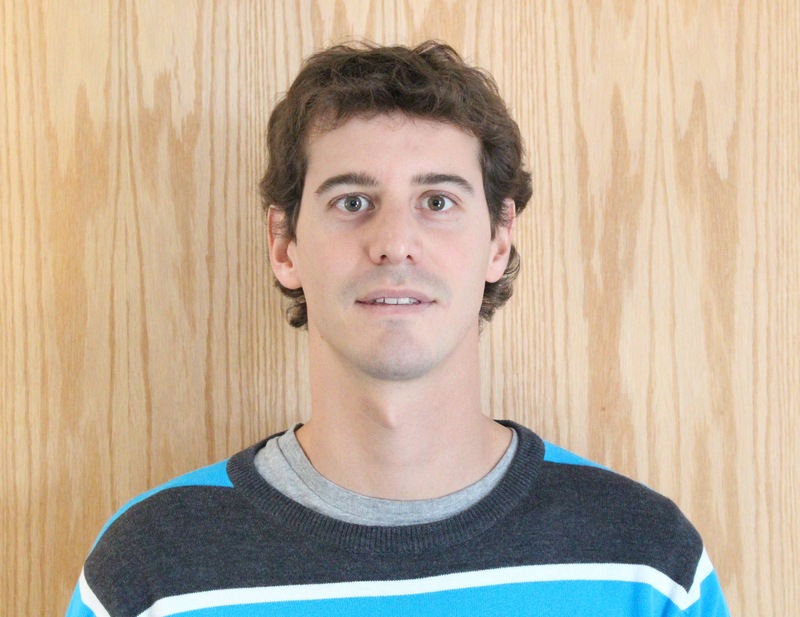 David Lopez brings valuable experience to UMaine Composites Center wind blade research. The Advanced Structures and Composites Center is one of only a handful of testing facilities capable of accommodating large wind turbine blades. The center’s ability to perform these tests has attracted many foreign and domestic clients looking certify blades of all sizes. David Lopez, a current graduate research assistant at the center, is looking to put his knowledge of large wind turbine blades to work. A native of Vitoria, Spain Lopez graduated from the Public University of Navarre with his engineer’s degree in Mechanical Engineering. He soon landed a job working for the international wind energy company Gamesa, working on modeling and testing wind blades. The UMaine Composites Center recently partnered with Gamesa to test and validate a 184 foot wind blade manufactured in Mexico. As a part of the partnership, Lopez came to oversee the testing. “As a part of my job, I came to the center for one month and I was very impressed with the knowledge and expertise of the team and the state-of-the-art testing facilities here,” Lopez said. Because of his knowledge about the particular blade being tested and his interest in enhancing his mechanical engineering knowledge, Rodriguez decided to return to the the University of Maine to pursue his master’s degree. “I wanted to get my master’s and expand my knowledge in wind energy with a focus on mechanical testing,” Rodriguez said. This focus includes modeling and performing fatigue tests, collecting data on the aerodynamic properties of the blades, and developing new testing equipment as blades become larger and larger. Lopez will be working on a team with John Arimond, Thomas Snape, Shawn Eary and Dr. Andrew Goupee, his graduate advisor, along with undergraduate students. Lopez is enjoying learning from this team of experienced engineers. Since the market is so new, Lopez is looking to contribute his industry experience to the team’s research. Lopez says he has enjoyed his first few weeks at the university. He is mostly impressed with the variety of projects at the center and hopes he can increase his involvement with ongoing research.